Dimensions 1 by 8.75 by 10.50 in. Amazon.com description: Product Description: The leading text for the Adolescence Psychology course, Adolescence, 9th edition is the most accurate and up to date text available. Applauded by adopters as eloquently written and intelligently presented, this text bears John Santrockâs trademark balance of accurate, current content for faculty and effective pedagogy for students. Learning goals have been incorporated into this edition to help students focus on the big ideas in adolescent development. The learning goals also serve as the organizing mechanism for the chapter review, student study guide, and on-line resources. A rich collection of media resources support the text and bring the critical experiments/concepts in adolescent development to life. About: This 8th edition of "Adolesence" has been updated. About: Connecting research and results. About: More students learn from John Santrock’s Adolescence than from any other text in this field. About: More undergraduate students continue to learn about the field of adolescent development from this text than from any other. About: The leading text for the Adolescence Psychology course, Adolescence, 9th edition is the most accurate and up to date text available. About: The leading text for the Adolescence Psychology course, Adolescence 8th edition is the most accurate and up to date text available. 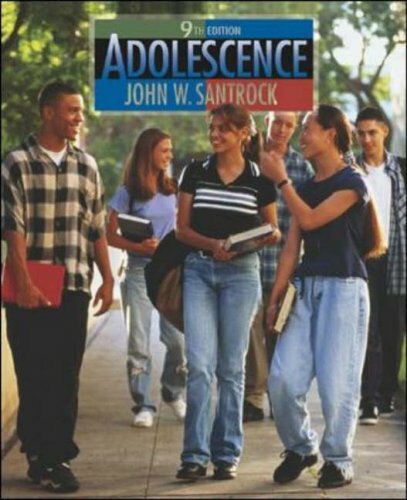 About: Accurate and up to date, eloquently written and intelligently presented John Santrock's Adolescence 7th edition strikes the balance for faculty and students.